Undersea cables and traffic hubs are at risk. Rising seas threaten more than 4,000 miles of buried fiber optic cables in densely populated US coastal regions, report researchers. Seattle is one of three cities at most risk of internet disruptions. In a talk to internet network researchers, Ramakrishnan Durairajan, an assistant professor in the computer and information science department at the University of Oregon, warned that most of the damage could come in the next 15 years. Strategies to reduce potential problems should be under consideration sooner rather than later, he says. The Durairajan-led study is the first risk assessment of climate change to the internet. By 2033, the study also found, that more than 1,100 internet traffic hubs will be surrounded by water. New York City and Miami are the other two most susceptible cities, but the impacts could ripple out and potentially disrupt global communications. Seawater effects projected by NOAA for 2033 for New York City on internet infrastructure. Undersea, long-haul fiber and metro fiber cables are in red/green/black, respectively, with submerged areas in blue. Seawater affects projected by NOAA for 2033 for Miami on internet infrastructure. 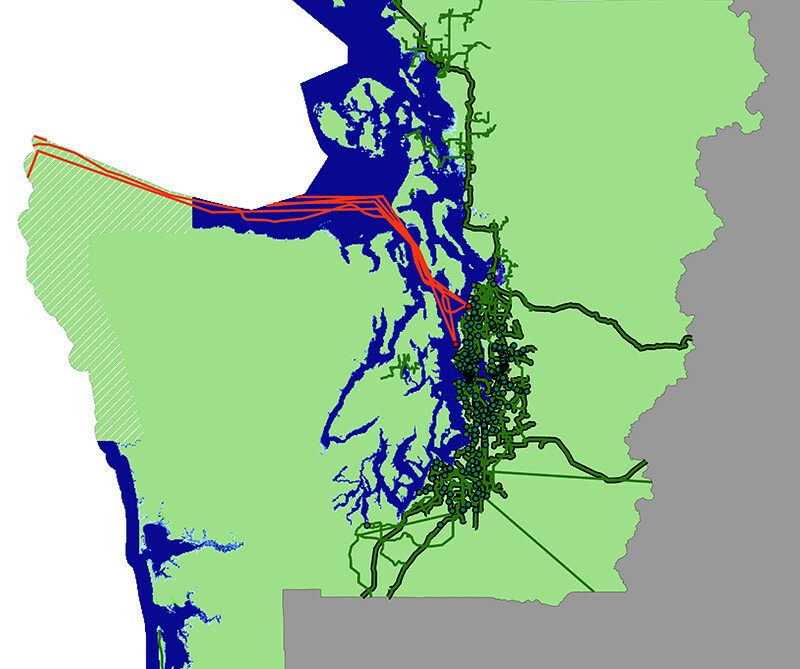 Seawater affects projected by NOAA for 2033 for Seattle on internet infrastructure. Barford is a leading expert on the “physical internet,” the buried fiber optic cables, data centers, traffic exchanges, and termination points that are the nerve centers, arteries, and hubs of the global information network. The study, which only considered US infrastructure, combined data from the Internet Atlas, a comprehensive global map of the internet’s physical structure, and projections of sea level incursion from the National Oceanic and Atmospheric Administration. The roots of the danger emerged inadvertently during the internet’s rapid growth in the 1980s, says Durairajan. Neither a vision of a global grid nor planning for climate change was considered during the technology explosion. Over time, layers of infrastructure were placed on top of each other. Despite advances in the technology, he says, those fiber lines remain in place and face the greatest risk. Buried fiber optic cables are designed to be water resistant, but unlike the marine cables that ferry data under the ocean, they are not waterproof. Conduits at most risk are already close to sea level. Only a slight rise in ocean levels due to melting polar ice and thermal expansion will be needed to expose buried fiber optic cables to seawater, the study found. Service disruptions during catastrophic storm surges and flooding that accompanied hurricanes Sandy and Katrina hinted at the problems to come, Barford and Durairajan note. Mitigation strategies are needed to strengthen the coastal infrastructure so that failures there do not become cascading failures that take out inland stations, Durairajan says. The effects of building seawalls, according to the study, are difficult to predict. The study also examined risks to buried assets of individual internet service providers, finding that Century Link, Inteliquent, and AT&T are at highest risk. Durairajan shared the findings with academic and industry researchers at the Applied Networking Workshop in Montreal on July 16, a meeting of the Association for Computing Machinery, the Internet Society, and the Institute of Electrical and Electronics Engineers. How will your city be affected by rising sea levels?